If you have read other posts on my blog, you probably know that I have something of an obsession with caramel and chocolate. Caramel is my all-time favorite decadent treat, followed closely by chocolate in all its forms, and the two are a match made in heaven. When I saw that Veron and Patricia had chosen Eric Kayser’s Milk Chocolate and Caramel Tart for this months Daring Bakers challenge, my pulse quickened and I immediately began to plan how many times I could make the tart in just one month. As it turned out, I only had one occasion for it, but we enjoyed it so much that I will make this a regular item for parties or Bunco night! 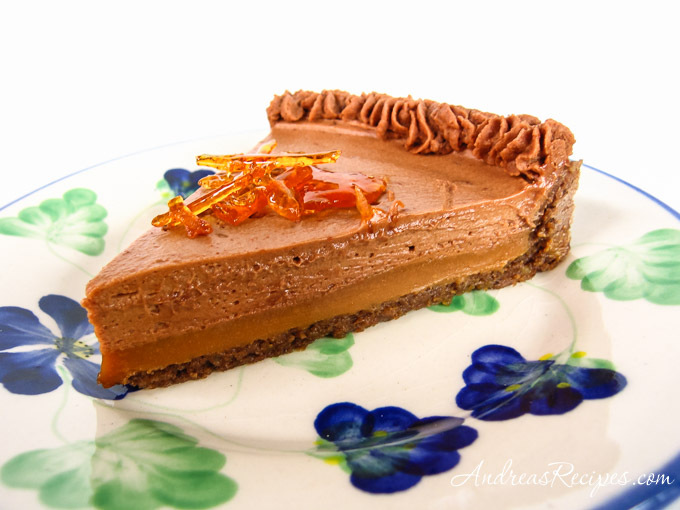 The layered tart has a chocolate cinnamon pastry crust, a rich caramel middle, and a chocolate mousse topping with sugar art decorations, and it is absolutely decadent. The moms in the neighborhood thoroughly enjoyed it and asked to take slices home to their husbands! The pastry dough requires overnight resting time in the frig, plus the baked caramel requires some cooling time, so make sure you plan ahead. The original recipe calls for a food processor to mix the pastry, but many food processor bowls are not large enough to hold all the pastry dough, so I recommend using a stand mixer instead. The pastry dough recipe makes a lot more than required for the tart, so I recommend dividing the dough and freezing some of it for later. 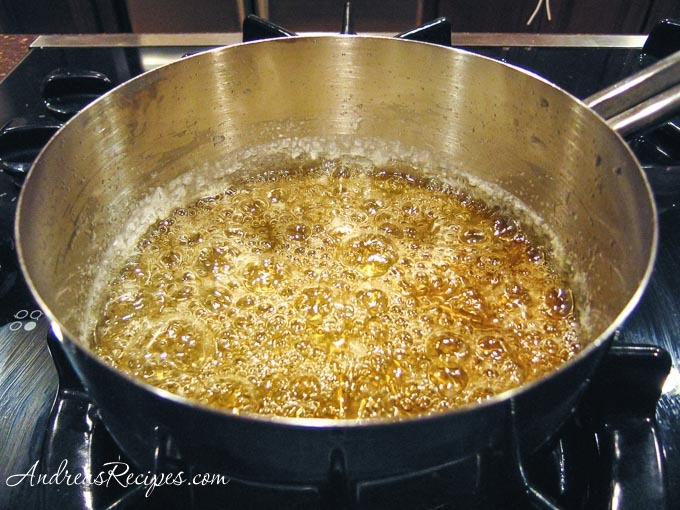 The sugar and caramel preparation calls for “the dry method,” which means cooking down plain granulated sugar until it dissolves into a solution. No liquids are added in the process; however, this method is tricky because 1) the sugar tends to crystallize very easily, thus rendering a grainy texture, and 2) it also burns very quickly if you don’t stay on top of it. It took me four tries to get the sugar decorations right. For ease of home cooking, I recommend making the caramel using a wet method with added water and corn syrup (see the instructions below) and adding a bit of corn syrup or lemon juice when making the sugar decorations, which will prevent large sucrose molecules from forming. 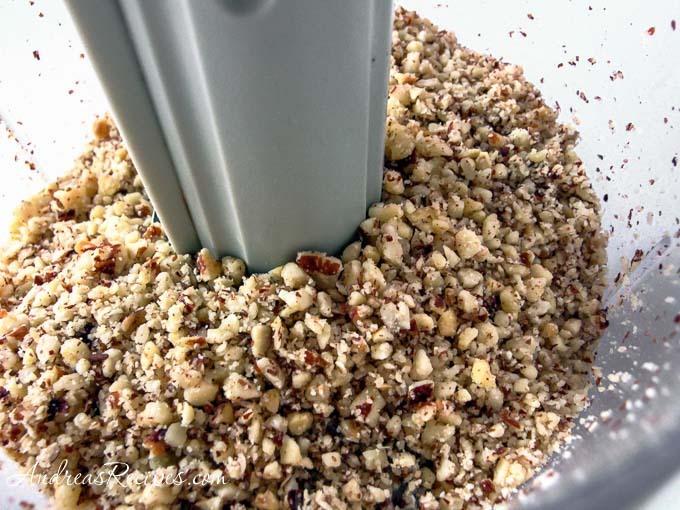 Regular all-purpose flour tends to clump when making the caramel filling, so sift thoroughly or use a finely sifted flour such as Wondra® or Pillsbury Shake and Blend. The heavy cream for the caramel is not the same as the whipping cream for the mousse. Heavy cream has a higher fat content, and because it will go into some very hot caramel, it should be at room temperature to avoid any explosions. Seriously! The caramel cream mixture bloomed up the pan as soon as I poured in the cream even though I had let the cream sit out on the counter the whole time I worked on the caramel sugar. The whipping cream for the mousse must be very cold so that it will whip up light and fluffy, so keep it in the frig until the last possible second. To see the original recipe, check out Veron’s post. The Daring Bakers have posted their photos and stories all over the Internet, and you can see the whole list at The Daring Bakers Blogroll. Adapted from Sweet and Savory Tarts, by Eric Kayser. 1. Put the butter into the bowl of the stand mixer and cream it using the paddle attachment. 2. Add the confectioners’ sugar, the ground hazelnuts, and the cinnamon, and mix together well. 3. Add the eggs, one by one, mixing continuously until fully incorporated. 4. 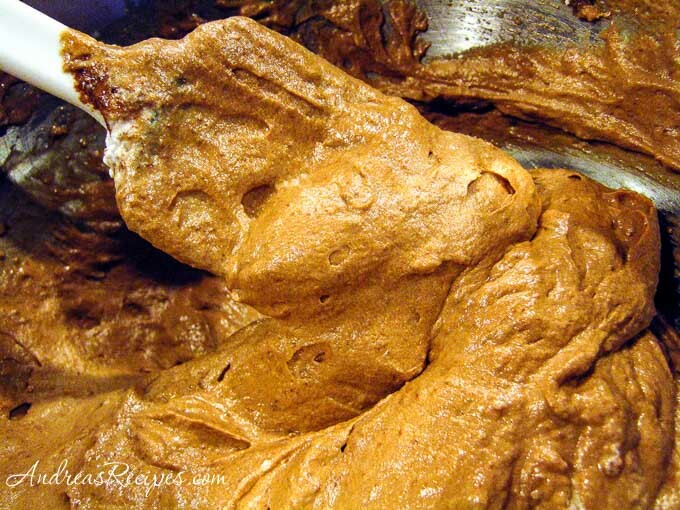 Sift in the flour, the baking powder, and the cocoa powder. Mix well, until a dough is formed. 5. Remove the dough from the bowl and divide the dough into three equal pieces. Shape each piece into a disk and cover in plastic wrap. Chill overnight. 1. Bake the Pastry: Preheat oven to 325 °F (160 °C). 2. Using one of the pieces of pastry, line the bottom and sides of the baking pan. If using a tart pan, bring the pastry all the way up to the top. If using a springform pan, bring the pastry about half way up the sides. Pour beans or rice into the bottom of the pastry, covering the surface. Bake in the preheated oven for 15 minutes. Remove from the oven and set aside. 4. Reduce the heat to low (heat setting 3 on my gas cooktop) and continue to slowly boil until the color of the caramel changes from clear to a deep, golden amber. Remove from heat immediately! Stir in the heavy cream or crème fraiche and then add the butter. Mix thoroughly. Set aside to cool. 5. In the small mixing bowl, beat the eggs and then whisk in the flour until no traces of flour are visible. Pour the egg and flour mixture into the cream-caramel mixture and mix thoroughly. 6. Pour the beans/rice out of the pastry shell, and add the caramel mixture. Bake in the preheated oven for 15 minutes. Remove from the oven and allow to cool completely. 7. Make the Chocolate Mousse: Put the chopped chocolate into the glass bowl and melt in the microwave, cooking for 30 seconds on medium heat. Stir and repeat until the chocolate is almost completely melted. Stir the remaining small bits of chocolate into the melted chocolate and set aside to cool. 8. When the chocolate is cool, put the whipping cream into the bowl of the stand mixer and beat it using the wire whisk attachment. The cream should have stiff peaks. Gently fold in the cooled chocolate until fully incorporated. Don’t beat it or the mousse will lose volume. 9. Make the Sugar Decorations: In the small sauce pan, add the sugar and corn syrup. Cook over medium heat (heat setting 5 on my gas cooktop), stirring constantly, until all of the sugar is dissolved and the mixture begins to boil. Stop stirring. 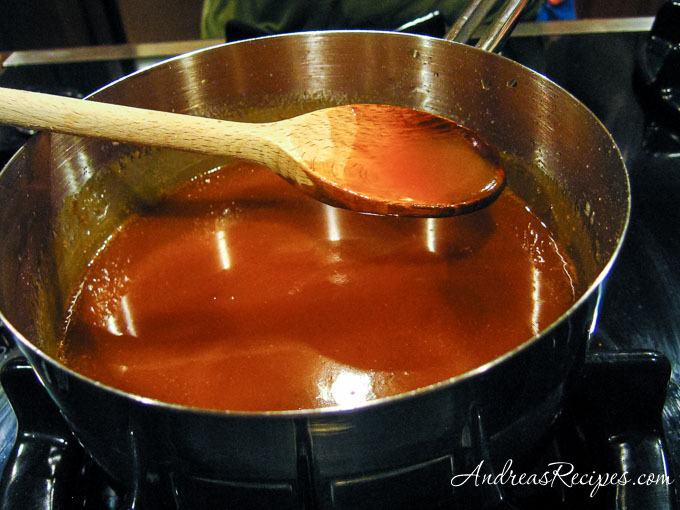 Reduce the heat to low (heat setting 3 on my gas cooktop) and continue to slowly boil until the color of the caramel changes from clear to light amber. Quickly pour it onto the parchment lined baking sheet, making designs as you go. The melted sugar will begin to cool as you pour and you will get some filaments, but that’s ok. Allow the sugar to cool thoroughly, then break it up into small pieces and put them on top of the tart. If your sugar happens to burn, just pour it out into a can from your recycle bin. Add water to the pan and set it back on the burner on low heat. This will break up the burnt sugar and make clean up a lot easier. Educator, photographer, tea drinker, avid cook, and gardener. I love helping people learn how to do great things. That first pic is so elegant! Very pretty Andrea! I’m sure the neighbors are more than happy to partake in sampling whatever comes out of your kitchen. I had no clumping using all-pupose flour in my caramel but using Wondra is a good tip. Your tart turned out beautifully. I love the uniformity of the coloring — and it looks sooooooo creamy! It’s beautiful!! I love your sugar decorations. your caramel decorations came out beautifully. great tips and photos! Your tart looks incredible! I would order that in a restaurant! Your tart is a thing of beauty! Well done! Yum! That looks so moist and yummy! Well done. I like your tips, they would make it much easier for anyone making this. Oooh, I love your sugar decorations! I’ve never used Wondra or Shake and Blend, but I might have to look into them. Your tart looks superb! I wanted to pipe around it too but my mousse started to melt a little in the heat. I like how your layers are so nice too. Well done Andrea! Love the nutty picture! Nice piped borders and your layers are pretty, overall, beauty tart! I’m just discovering your blog and I already loooove it. I miss Bunco – perhaps I need to import it to NZ. You did a beautiful job on your tart. Thanks for all that background info on the recipe. Your tart is really beautiful. I love the sugar decorations. Wow! Lovely pics and I like how you’ve broken down all your tips, etc. 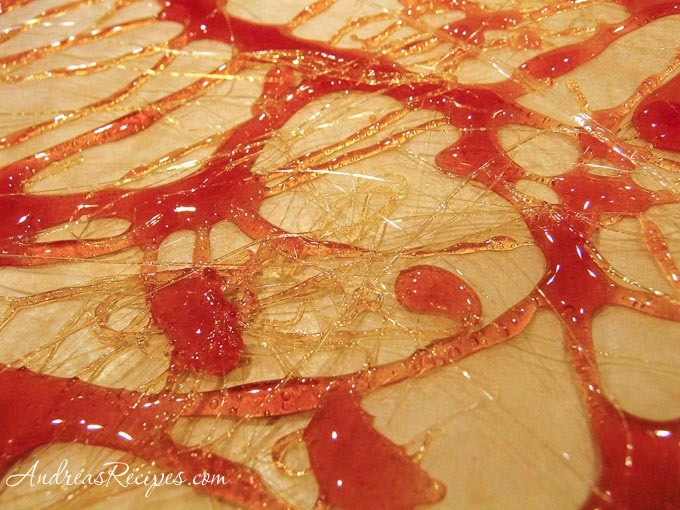 Beautiful, Andrea – love your caramel decorations! What a treat! And the decoration is so beautiful! Love the caramel shards on top, and your mousse looks so creamy! Andrea, I love you sugar art decorations and the tart looks so scrumptious! 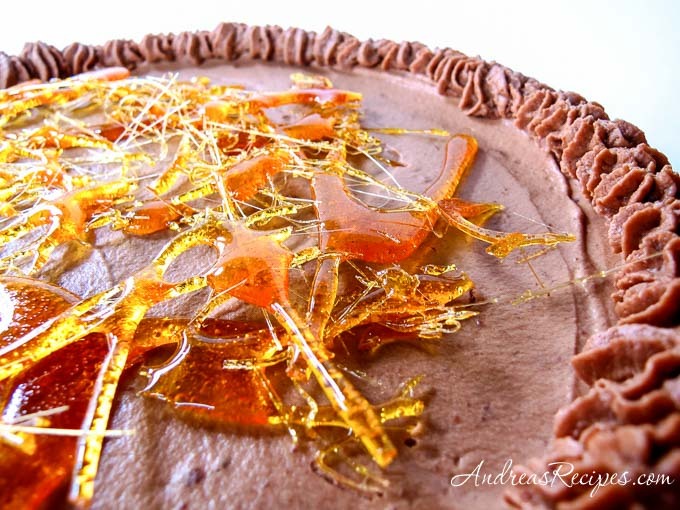 Beautiful tart Andrea! Love the caramel chards on top! Beautiful job and great tips for your readers too! Wonderful work and great post Andrea! Your tart looks lovely. I love the perspective of the photographs too. You’re getting so good Andrea! Food is the hardest thing to photograph and make look good. It looks fabulous! The border is really cute and the caramel shards are beautiful. My dear Daring Bakers, you all so sweet! Thank you, and I just LOVE being a member of this group! Andrea, I love your decoration sugar! Really outstanding. Great job. Your tart looks lovely! Great job! Your tart looks wonderful. I love how you write about the tart like a recipe. Thanks for the reference on sugar science. I will make this tart again for a PTO social event on Tuesday. Your caramel decorations look great, too. Lovely looking tart Andrea! Simply awesome! I love your tips for making the tart… they’ll certainly come in handy when I finally get around to making it! absolutely gorgeous tart! i love the border and the decorations…fabulous job! Great job! I love your tips! Hi Andrea thanks for stopping by my blog. Your tart looks wonderful. Wow, the contrast of your lovely tart on the white plate is gorgeous! Great job on the challenge this month!! I tried this tart today and it does not look like yours at all!!!! Wow! I was impressed before, but now that i tried it myself I have to say you did a wonderful job! You should open your own café or bakery…! Sveta, thank you for the nice comments, and I’m glad you tried the tart! Thanks for visiting and joining the conversation. All comments are moderated. You may not use any photos or original text without express permission.